Sure, card playing with kids is awesomely fun. But did you know that it also could be good for learning and emotional health? If you haven't played cards with your kids before, you may just change that routine soon. According to ParentingScience.com, studies show cognitive benefits to play, which could include card playing. Kids who play often are proven to excel in academics. Frequent play also improves memory, problem-solving skills, math skills, and even language skills. This could be due to the fact that many types of play involve utilizing those skills. 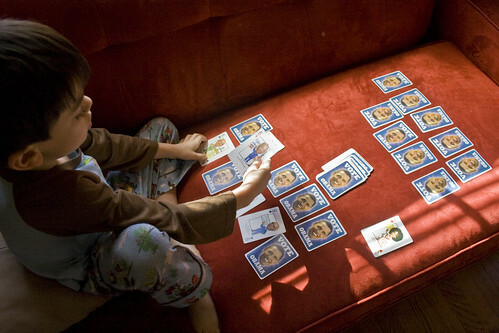 Memory and Match-Up card games for kids are particularly beneficial. They can help improve concentration, train visual memory, improve vocabulary, increase hand-eye coordination, increase short-term memory, practice and increase attention to detail, help to classify objects, help to differentiate objects, and help to familiarize traits in specific objects. The benefits are so strong that card playing is often used to help fight off memory and cognitive conditions like dementia and Alzheimer's Disease. Looking at card games in particular, see how many you can think of that involve using oral language skills, math, hand-eye coordination, problem-solving skills, and an emotional connection to other players. Have you played cards with your kids lately? Which games are favorites?